and also drawn into the dxf file of the part. The edging material is calculated at it’s maximum length. 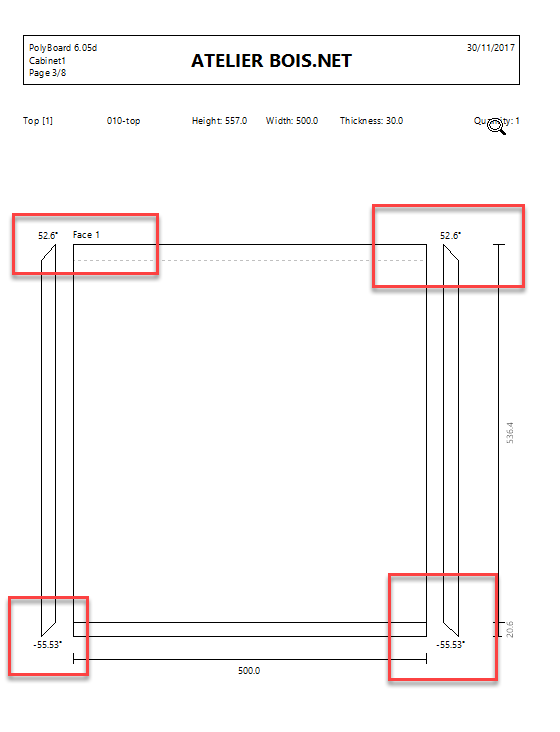 As on attached image: Example of how we would specify edging for this panel would be: 1 – 2mm ABS, 2 – 2mm ABS, 3 – [some amount of degrees, for example: 15°], 4 – no edge. All of this information I need on an Excel sheet. My question: where within the program can I find the information about this edge angle? P.S. The wardrobe on this image is sloped wardrobe.pb-cab from Quick Design Libraries. are you asking if you can get drawings or indication of the 45° angle on the edging materials? Polyboard will calculate edging the same length as the total board length, so if a board is 1m long and mitred the edging will always be 1m too. I am having a problem with exporting the data about the egde angles. Lets say I have a miter joint and I want to export the data about the edge angles for the cutting list. How do I do that? My work-around for now was to create an egde material, call it “45°” and create an edge style sub-method. It works for 90° joints but what about if I have non-90° angles?